(Nanowerk News) A research team led by Lucas Pelkmans at ETH Zürich has managed to decipher a well-known phenomenon that had, until now, remained unexplained: why cells of the same type can react differently and what the reason for this is. Cell-to-cell variability in clathrin-mediated endocytosis (green signal) is determined by local cell density. The properties of a cell population determine the different cell activities observed in cells of the same type. This is the conclusion drawn by a research team lead by Lucas Pelkmans, professor at the Institute for Molecular Systems Biology at ETH Zürich. 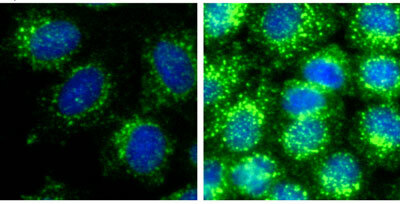 The scientists examined the cause of the well-known phenomenon of cell heterogeneity. Until now, the reasons behind the different reactions seen in cells of the same type had not been scrutinised. After three years of intensive development and research work, researchers have developed a computer-supported process, which allows them to observe the processes behind the variability of individual cells in cell cultures with millions of cells for the first time, and uncover the secret behind these processes. Until now, cell variability was simply called “noise”, implying statistical random distribution. However, the results of the study now show that the different reactions are not random, but that certain causes lead to predictable distribution patterns. The study has now been published in Nature ("Population context determines cell-to-cell variability in endocytosis and virus infection") and Pelkmans is glad to be reaping the first rewards for the research project, which was supported by ETH Zürich to the sum of 1.8 million Swiss Francs. “For the project, we created an automated setup, the RNAi image-based screening centre, which we used to carry out a high turnover of cell experiments”, Pelkmans explains. The computer-supported methods were developed in conjunction with the experiments and allow the phenotypes of the cells to be quantified and described automatically. The data is fed into models and used to show how individual cell properties develop and affect each other. The scientists focused their study on the cell properties predetermined by the population of the cell culture. This includes, for example, the size of the population, the local cell density, the size of an individual cell, whether the cell is on the edge of the cell culture and therefore not limited by another cell on one side, whether the cell is in the process of duplicating its nucleus (mitosis) or whether it is in the process of so-called programmed cell death. For each cell, the scientists examined the variety in endocytosis activity, by which cells invaginate parts of its biological membrane and absorbs the surrounding medium. They further looked at the variable amounts of a certain fat molecule (sphingolipid) on the surface of the cell, which plays an important role in relaying the cell’s signals and reactions. They also infected the cell culture with three different viruses and observed the differences in progression of the infection. “We created a multivariable analysis of individual cells and obtained a very large number of very different readings”, Pelkmans explains. With this huge volume of data, the researchers used computer models to determine which variables affect each other. This allowed them to establish many rules, coined “heterogeneity signatures” by the scientists, which describe the way in which population-dependant properties of a cell culture influence cell reactions in the models. As the next step, the scientists tested how well the models would be able to predict the reactions of the cell. It was shown that this is possible with a high degree of accuracy and that the variability is clearly determined by the properties of the cell population. The cell cultures are naturally different from one another, explaining the broad variation in reactions of individual cells in the respective cell cultures during endocytosis and viral infections. For example, endocytosis is more uniform and is easier to control when the cell culture is densely populated, and certain diarrhoea-causing viruses can infect a less densely populated cell area more easily. The findings are of particular significance for research using comparative cell cultures: “This is one of the most important methods, but at the same time also one that poses big problems for cell biologists”, says Pelkmans. The study has shown that reactions in two cell cultures can be better compared when the models to predict these reactions in each cell culture are used as a reference, taking into account the effect of the properties of a cell population of at least ten thousand cells. This is an important aspect, for example, for the pharmaceutical industry. As the study shows, many changes do not directly influence the cell, but the population as a whole, which then leads to changes in behaviour of individual cells.